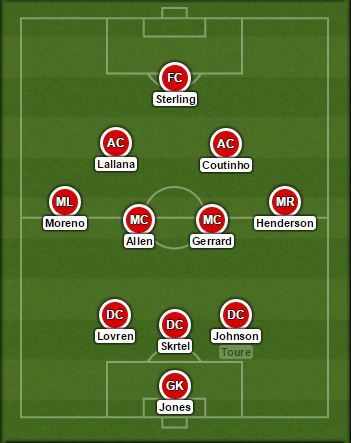 Liverpool began this game in a 3-4-2-1 formation, with both Adam Lallana and Philippe Coutinho in narrow roles supporting lone striker Raheem Sterling. Although they trailed by two goals at half-time, the decision to abandon this shape was an error of judgement that hampered their ability to get back into the game. The main characteristic of the first half was how often Liverpool found themselves presented with counter-attacking opportunities. Neither Lallana nor Coutinho tracked United’s wing-backs all the way, meaning that when the away side regained possession they often had three men in advanced positions waiting for the first ball out of defence. United picked up four bookings in the first half, all four of which stemmed from cynical attempts to snuff out nascent counter attacks. Coutinho was responsible for forcing the concession of three of these fouls, Lallana the other one. The deepest midfielder in United’s 3-5-2, Marouane Fellaini, was particularly befuddled by Liverpool’s attacking intent. The away side’s high pressing forced him into several misplaced passes and poor touches over the course of the first 45. Yet, marvel at how his performance improved in the second half. 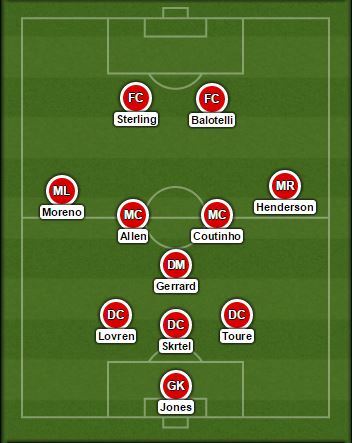 Rodgers’ decision to replace Lallana with Balotelli and move to a 3-1-4-2 meant that United’s holder was no longer overrun by two Liverpool attacking midfielders. Liverpool’s extra man in that zone had been forfeited, and United’s three could now afford to man-mark Liverpool’s three. Fellaini went on to end the game as the top passer, tackler and blocker. His tackle count, at ten, was particularly impressive. Seven of these were executed in the second half. Last Monday’s victory over Southampton saw Manchester United record the lowest shots total in a Premier League game since Opta began collecting statistics in 2003. They attempted only three strikes on goal – all from Robin Van Persie – two of which went in. The victory over Arsenal was little different, where United somehow found themselves two goals to the good despite only striking one shot in anger. Even the seemingly routine 3-0 victory over Hull saw only six shots on target conjured from almost 70% of the possession. Quite often you will hear the refrain “It was straight at him!” as an argument against a goalkeeper’s contribution. It’s certainly unfortunate for goalkeepers that it is often only the spectacular diving saves that are sufficiently appreciated by fans. For observers of this game, David De Gea’s world-class 67th minute stop from Balotelli would have been enough to impress on its own. Fortunately for his United side, there were seven others, including four successful one-on-ones – all of which were “straight at him”. Now, admittedly, poor finishing was partly to blame for Liverpool’s profligacy in front of goal today. But the main portion of the credit for United’s clean sheet must go to De Gea’s positioning, composure and stature in the face of incoming opposition strikers. De Gea stands up as long as possible, makes himself look as large as possible, and forces his opponent to make a big decision under pressure. Compare and contrast to poor old Brad Jones, who kindly dived out of United’s way for the first and third goals – a big insight into why the abject Simon Mignolet has survived in the team up to now.